It’s the new year! The blogosphere has been bursting at the seams with people sharing their goals and resolutions. If you haven’t done any goal setting for 2014 yet, here are some helpful posts for you. Emily at The Orange Slate shared a Bucket List for 2014 with us. It will definitely get your creative juices flowing if you’re at a loss for what goals to set. Seth Godin wrote a short, satirical post about goals at the beginning of 2009. It’s 5 years old, but still applies. If you’re ready to get started, but aren’t sure how, Michael Hyatt can get you on the right track with The Beginner’s Guide to Goal Setting and why you should write those goals down. 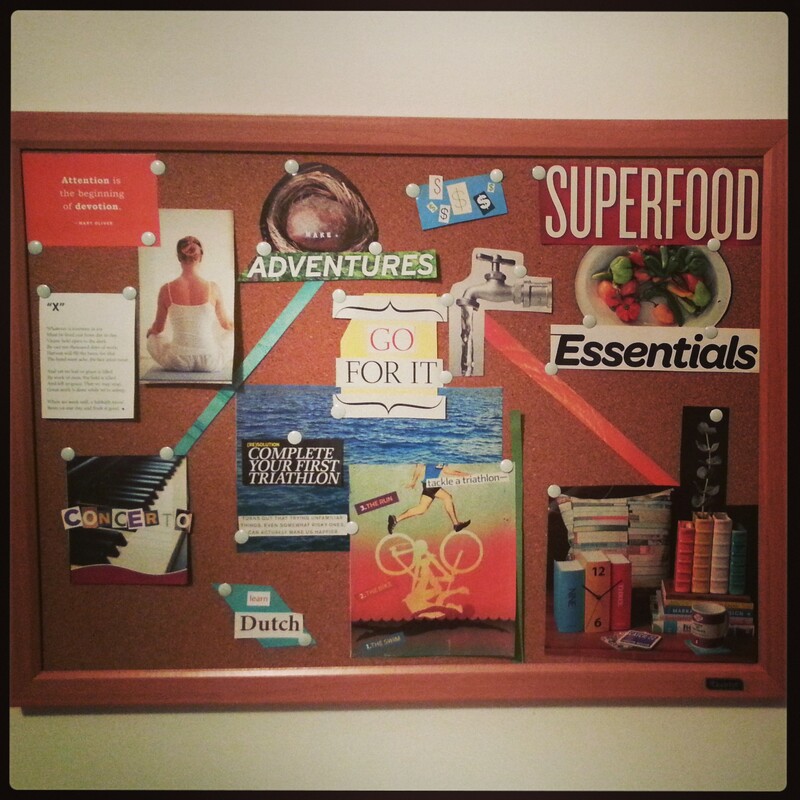 My favorite way to represent my goals in something physical, something visible, is to create a vision board. It sits above my desk in the office, and I see it more days of the week than not. It reminds me what I want to accomplish this year. This year, I’ve divvied my goals into two categories. My specific goals are goals that have an end. They have a date of completion. They are something to accomplish. The general goals are themes for my year, things I want to be conscious of. These goals don’t have an ending point, as they’re things I hope to incorporate into my life well past December 31, 2014. Learn some Dutch (CDs–ordered). I have a 45 minute commute to work, so I purchased a method that is CD based. Play a concerto with an orchestra. I’ve been working on this one since September, and will be playing with our local symphony in May. Build our emergency fund. This will mean we have 6 months of living expenses in a savings account, so if anything were to happen (medical emergency, job loss, etc), we’d be covered. The water faucet is for two goals–drink more water, but also be more conscious of the water I’m using. I know I can be wasteful when it comes to water usage, and I want to get that under control. Superfood/Essentials. Get back to a place where I’m eating primarily whole foods. Not 100% of the time, my sweet tooth is too big for that. But most of the time. Yoga girl. That corner is about being mindful. Build meditation into my days, and carve out time for peace and quiet. I wanna know: What are your goals for 2014? Do you have specific and general goals, also?